JIMINY CRICKET PRODUCTION CEL WALT DISNEY STUDIOS GOUACHE ON CEL, 1940. Original hand painted and hand inked production animation cel of Jiminy Cricket from "Pinocchio, " 1940, Walt Disney Studios; Set over a Courvoisier air brush background; Unframed. Pinocchio: What's a conscience? Jiminy Cricket: What's a conscience! A conscience is that still small voice that people won't listen to. That's just the trouble with the world today... "Pinocchio, " 1940 was the second animated feature film produced by Disney, and followed on the success of Snow White and the Seven Dwarfs. It was released to theaters by RKO Radio Pictures on February 23, 1940 and was based on the Italian children's novel "The Adventures of Pinocchio" by Carlo Collodi. The general plot of the film involves an old wood-carver named Geppetto, who carves a wooden puppet that he names Pinocchio. One night the puppet is brought to life by the Blue Fairy, who informs him that he can become a real boy if he proves himself to be "brave, truthful, and unselfish". Pinocchio's journey to become a real boy is challenged by his encounters with an array of scrupulous characters. "Pinocchio" became the first animated feature to win an Academy Award; it won for both Best Music - Original Score and for Best Music - Original Song for When You Wish Upon A Star.
" Most critics and audiences agree that "Pinocchio is among the finest Disney features ever made, and one of the greatest animated films of all time. In 1994, it was added to the United States National Film Registry as being culturally, historically, or aesthetically significant. Due to the huge success of "Snow White, " Walt Disney wanted more famous voice actors for Pinocchio. Disney also wanted the character of Pinocchio to be voiced by a real child. The role ended up going to twelve year old actor Dickie Jones, who had previously been in Frank Capra's enormous Hollywood hit, Mr. Animation began in September 1938 and just as in "Snow White, " live-action footage was shot for "Pinocchio" with the actors playing the scenes; which was supervised by Hamilton Luske. The animators then used the footage as a guide for their animation drawings by studying the human movement and then incorporating many of those poses and scenes. The title character was animated by Milt Kahl (initial design), Frank Thomas, and Ollie Johnston. "When I was doing Pinocchio, " Johnston said, I thought of the character being real, a living person, not a drawing. Jiminy Cricket was animated by Ward Kimball, with Joe Grant working up early rough model sketches. Kimball would go on to work on many characters for the Walt Disney studios, including the Mad Hatter and Cheshire Cat in "Alice In Wonderland;" however the great Disney animators Frank Thomas and Ollie Johnston thought that Kimball's animation of Jiminy Cricket was the most sincere he ever did. From veteran Walt Disney animator Andreas Deja. Ward Kimball surely was looking forward to animating Jiminy Cricket, after the bad experience he just had on Snow White. His brilliantly animated "Soup Eating Sequence" had been cut from the film, and now it was time for a fresh start on the next feature film Pinocchio. Even though Walt Disney personally assigned the Cricket to Kimball, the animator didn't seem to be able to please the boss with his initial designs. Not appealing, too grotesque and insect like! After many revised versions in which Ward de-insectified the design, Walt finally approved a design that though very appealing had very little to do with the anatomy of a real cricket. 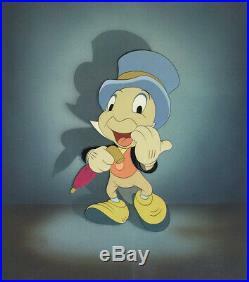 Measurements: Size - Jiminy Cricket: 6 x 3 1/2", Image 9 1/2 x 8 1/4". Condition: See pictures of the actual cel, which is in excellent overall condition as shown by the pictures above! All items we sell are from a smoke-free/mold-free home/workplace and are in excellent condition unless otherwise noted. I own every work pictured for sale and I stand behind every item. Please follow/bookmark me as a favorite and keep checking back for more items for sale in the coming weeks. For now, please check out my other Drawings and Cels and other original modern and contemporary artwork for sale! The item "1940 RARE WALT DISNEY PINOCCHIO JIMINY CRICKET ORIGINAL PRODUCTION ANIMATION CEL" is in sale since Sunday, March 24, 2019. This item is in the category "Collectibles\Animation Art & Characters\Animation Art\Production Art". The seller is "shadowline" and is located in Durham, North Carolina. This item can be shipped worldwide.